Do you ship cremation jewelry to Canada? We do ship cremation jewelry to Canada! Once your order is processed, the keepsake leaves our facility within 24-48 hours. 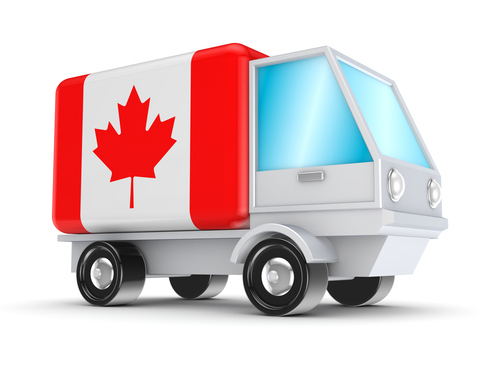 We offer a variety of shipping methods to Canada including USPS priority and USPS express. Additionally, we offer FedEx ground, expedited and express service to our Canadian customers. Do I have to pay duty and tax on my keepsake? The Canada Border Services Agency may impose duty and tax charges on your keepsake purchase. This is not a charge from Jewelry Keepsakes. To learn more about paying duty and taxes when shipping to Canada please visit this site. Do you know how much the duty and tax will be? The Canada Border Services Agency offers a Duty and Taxes Estimator. Please not this is an estimation only click here. How long will it take my keepsake to arrive in Canada? If shipping to Canada using USPS, shipments typically arrive in 3-10 business days depending on which USPS delivery method you select. 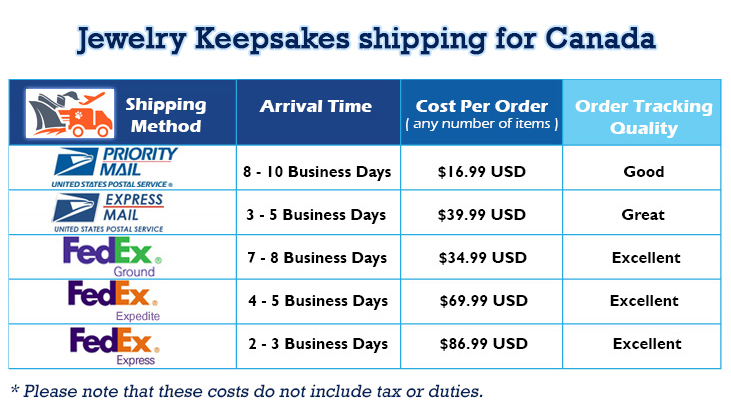 If shipping to Canada using FedEx, your keepsake will typically arrive in 2-8 business days. It is important to note that if your package is stopped at customs, it will delay shipment. How long before my keepsake purchase ships? We process most orders within 24-48 hours after receiving them. After being process, your order typically leaves our warehouse within a 24 hour time period. There are some specialty keepsakes such as 14k gold pendants that are special order and do not ship for 3-4 weeks. If you have questions regarding a particular keepsake and its shipping dates, please contact our customer service. Our Canadian toll free phone number is 289-470-1159. What are my shipping options for Canada? We offer postal service shipping and FedEx. Our rates are as follows. Do you guarantee the arrival time/day? We cannot guarantee the arrival time/day of your package to Canada. If you package is stopped at customs, it will delay your shipment. This is a situation that is out of the control of Jewelry Keepsakes. You can find out more about importing goods across the Canadian border here. Is there an international number for Jewelry Keepsakes I can call with questions? Yes. Canadian customers can call toll free to 289-470-1159.